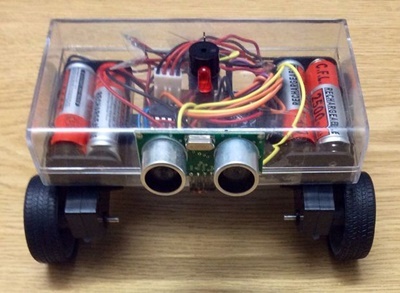 In this project, m-shams shows you how to build a mini-sonar robot with arduino pro mini. The robot used ultrasonic sensors (HC-SR04) to avoid obstacle. The sensor work principle similar to radar or sonar, which evaluate attributes of a target by interpreting the echoes from radio or sound waves respectively. By measuring the time interval between sending the signal and receiving the echo, the robot can determine the distance to object. Minimum distance is the stopping distance to prevent crash. The best distance from any block to stop the robot, is depends on the gearbox speed. Robot comes back to max distance. backDist and turnDist should be customized depend on the robot speed. A random behavior including a stop, melody and random movement has used. If you are new to robotic, this project is good for your first project.